On the surface it sounds nice. Combining Zappos.com with Amazon sure sounds like a powerful combination. Both companies care about their customers obsessively. Both are innovative. And Amazon has sure built an amazing distribution system. But, I’m not sure. While I don’t follow Zappos.com or Amazon closely, I wonder if the sum is less than to total of the parts. While it certainly hasn’t been a wise idea to bet against either of these companies, I wonder if this won’t be looked at more as a distraction than an accelerator. The purchase of Zappos.com accentuates the fogginess to the question: What is Amazon? The purchase by Amazon opens up the question as to whether the internal cultures of these companies will actually mesh. Will all of the things that made Zappos so special transfer after the purchase in the long-term? It seems to me that Amazon is following the path of Ebay, who built a tremendous business by disrupting the auction and classified advertising businesses. Ebay was a world-beater and could do no wrong. Then, in the name of synergy, Ebay went on a buying spree. The result has been a company that has gone nowhere. Apple, on the other hand, has followed the path of going deeper and deeper to delight its core customers and to allow new customers to find the core. As the graph below highlights, Ebay was a far better performer than Apple from 2001-2005 (disclaimer: I am by no means saying that stock performance is the key factor in judging success, I’m merely using this to highlight a point). 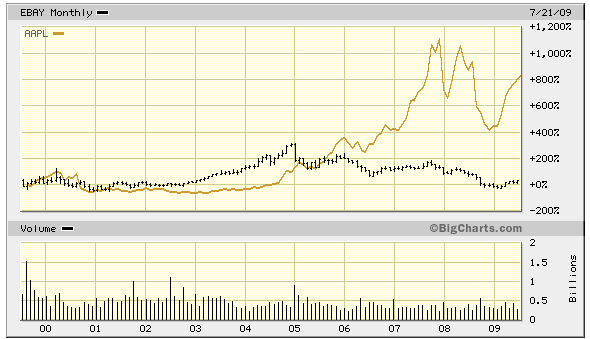 As Ebay spread itself thinner, Apple became a far better performer and has outperformed Ebay by a factor of 8! My recipe for success is that results equals focus times velocity. I wonder if both companies wouldn’t be better off in the long-term if they had pursued their own paths and increased their focus. We’ll never know. But in this time of celebrating the marriage of two wonderful companies, it’s a question worth asking. What do you think? UPDATE: Just read a take on the merger from Seth Godin. While he doesn't clearly express his opinion about the merger, his observations echo my thoughts. When you look at the list of "what Amazon is buying," it doesn't contain anything that Amazon hasn't already built - thus making the rationale less than clear.